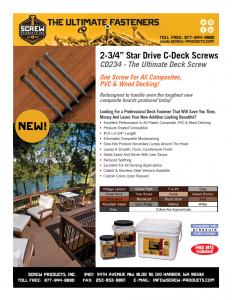 Screw Products, Inc. manufactures the Ultimate Star Drive Wood Screws, DeckLok – the Advanced Lateral Anchor, the Ultimate Hidden Deck Fastener & more! 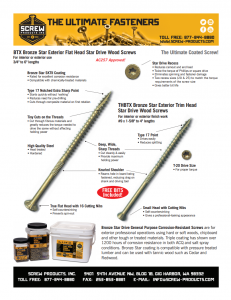 Corrosion-resistant Bronze Star drive general purpose AC257 compliant wood screws are for exterior and interior professional applications using soft woods, chipboard, hard woods, and other tough or treated materials. Triple coating has shown over 1200 hours of corrosion resistance in both ACQ and salt spray conditions. Bronze Star coating is compatible with pressure treated lumber and can be used with tannic wood, Cedar or Redwood. 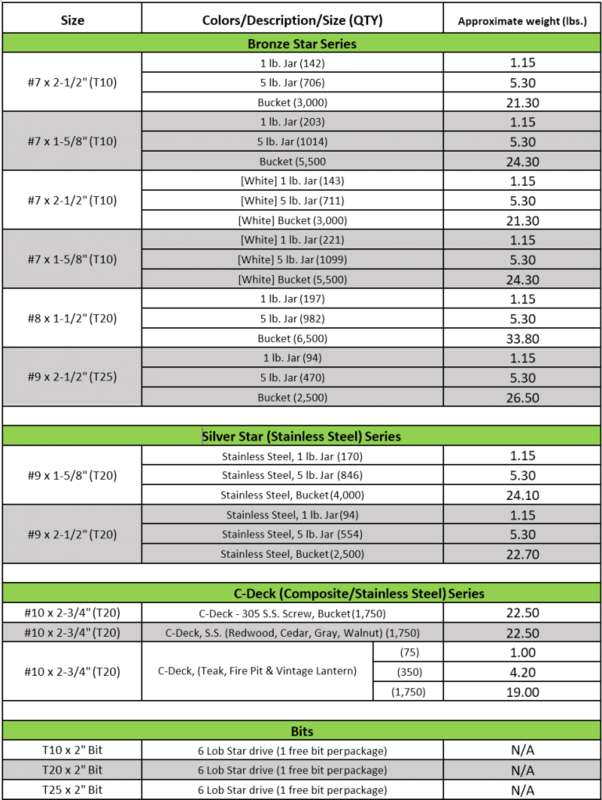 Silver Star stainless steel wood screws for use with all chemically treated materials, plywood applications, and all wood applications which are exposed to weather, high moisture, and other caustic conditions. Provides extra corrosion resistance and works excellent on projects where staining is required. Manufactured from the finest stainless steel alloys. 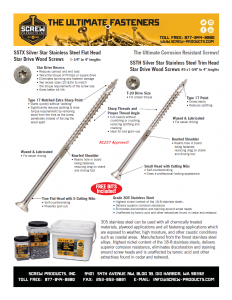 Highest nickel content of the 18-8 stainless steels, delivers superior corrosion resistance, eliminates discoloration and staining around screw heads, and is unaffected by tannic acid and other extractives found in cedar and redwood. 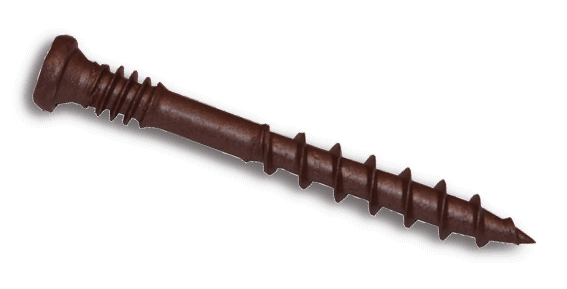 C-Deck composite deck screws are built for interior and exterior use with wood, composite, and other plastic materials. 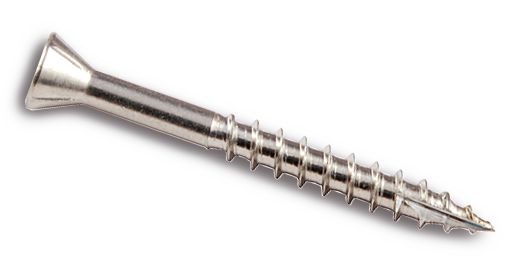 These screws are specially designed to eliminate the mushrooming and blemishes that can occur on composite materials. They are also an excellent choice for wood decks, where the top threads work to pull down and hold warped lumber, and lock the boards together. A multipurpose fastener which meets the challenge regardless of the material used. 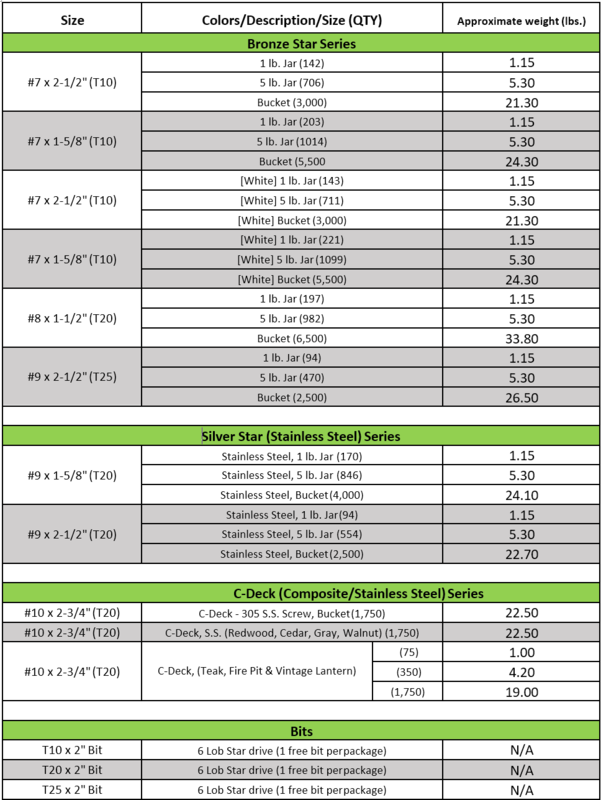 Click the chart for a larger view.